Longleaf Wilderness Medicine originated on Alabama's Gulf Coast in response to the needs of communities for remote emergency medical training during natural disasters. LWM has since grown to provide courses for many communities which need access to quality and accessible medical training. From the early courses along the Gulf Coast to the current national programing, the staff at LWM have maintained the mission of providing wilderness medicine education for both individuals and communities. Longleaf Wilderness Medicine is proud to offer courses for local and federal government agencies, expedition guides, wilderness instructors, remote travelers, and those interested in being more prepared for natural disasters or medical emergencies. In every location we serve, the staff of Longleaf Wilderness Medicine strive to provide the best emergency medical training available. 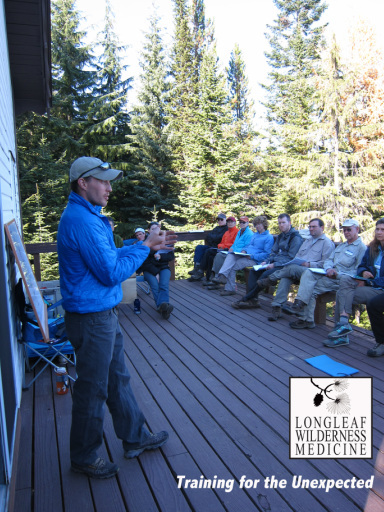 When you take a course from LWM, you can be sure that you will have instructors who are passionate teachers and have a comprehensive knowledge of wilderness medicine. Longleaf Wilderness Medicine courses have been developed based on current research of the incidents that occur in remote environments and the treatments that work most effectively. This accurate and detailed medical information is combined with LWM’s expertise in educational techniques. By employing staff and instructors with extensive training and teaching experience, LWM is able to provide an exceptional learning environment for our participants. LWM is a supporting organization of the Scope of Practice (SOP) documents for Wilderness First Aid and Wilderness First Responder courses. These documents were created by group of wilderness medicine providers and have become the standard for WFA or WFR courses. LWM actively works to develop new educational methods to improve information retention and to make its education accessible to a wider audience. Take a LWM course today and experience the LWM difference!